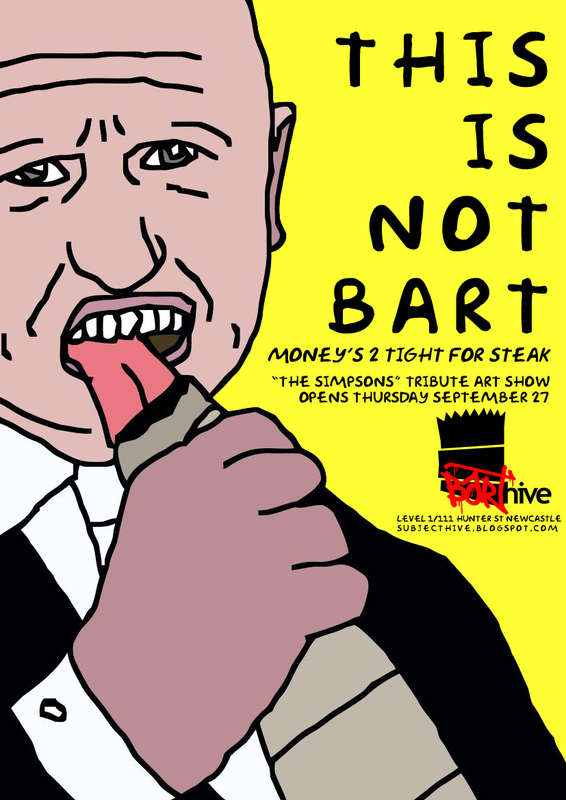 Newcastle's 2nd annual The Simpsons themed group art show!! What would a Simpsons themed anything be without ENDLESS REPEATS. In the year following 2011's popular This Is Not Bart show, we have been hounded by occasional requests for a follow-up. We were going to do it anyway. Here it is! Bigger! Better! Not Bart-er! What else were we going to do? We will be screening the complete and stomach churning Hommer Simpson series by HUTZ (including the controversial and TOOHOTFORYOUTUBE Hommer Simpson Part 6) and featuring work by Bongo Comics artist Dean Rankine ('Simpsons Comics' #180, #182, #183, #184, #186, 'Futurama' #62 and 'Bart Simpson’s Pal, Milhouse' #1. ), as well as a massive selection of work by Simpsons fans and artists from Newcastle and all over Australia. So come to the opening night party, there will be music, food, drinks, obscure pop-culture references and good times. Also, Renew Newcastle will be conducting a Spring City Walk from 4.30pm taking in special events at local shops and projects, including ARThive, so if you're more comfortable looking at art and things in large groups, follow them around! Now check out this list of featured artists! It's gigantic!